About 6 months ago, the Apple enthusiasts in our office (so, all of us) gathered ‘round the Apple TV at our office conference table to watch the livestream of Apple's keynote from their annual Worldwide Developers Conference (WWDC 2017). As it usually does, the ensuing internet chatter mainly focused on the new products Apple announced (iMac Pro, new iPad, HomePod, etc). 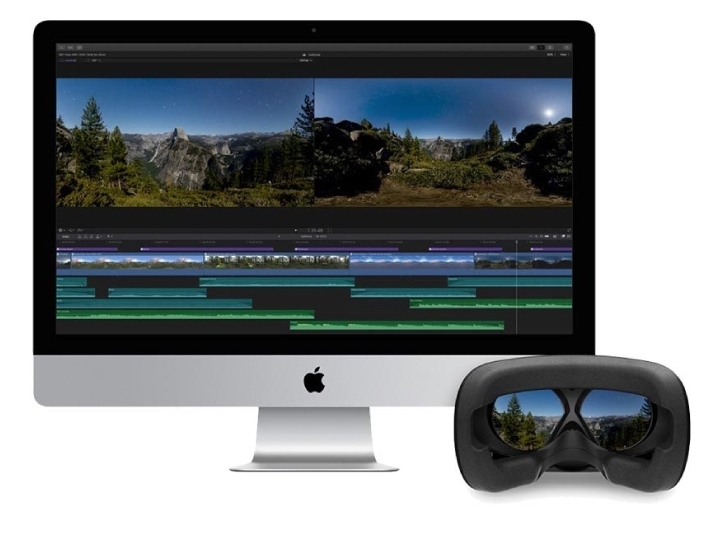 But at the FCM office, we were most excited to finally hear Apple talk about VR – specifically, that they'd be bringing 360º video editing support to a future version of Final Cut Pro X. That update just arrived last month, giving us a great reason to revisit our blog series on virtual reality. Part 1 and Part 2 focused mainly on how VR tech is growing and evolving. However, for this entry we'll dispense with the long-term tech speculation (tech-ulation?) and instead focus on the present and immediate future – mainly, the new VR tools in Final Cut, and why you may see an uptick in 360º video content from FCM, sooner than you think. Our production crew relies on Apple's hardware and software for many aspects of what we do. We all have iPhones and use iCloud, most of us have Apple Watches and iPads, and we edit our footage on iMacs running Final Cut – Apple's Pro video editing software. So whenever Apple delivers a new keynote of announcements, it's a near certainty that at least part of it will be relevant to our work. Do we also enjoy eating snacks around the conference table and improvising zany backstories for all the nerdy Apple execs on stage? Of course we do. But the point is, we technically have a legitimate work-related reason to watch these keynotes. Another classic snafu from one of our favorite keynote characters, Senior VP of Software Engineering Craig Federighi. He's such a Chandler! We've had our sights set on VR filmmaking for awhile now, but until last June's keynote, Apple had been silent on the subject. So when they announced new VR-ready iMacs, native VR engine support in macOS, and new VR editing tools in Final Cut Pro X, we were delightfully surprised. However, while the new iMacs with VR graphics upgrades sounded great, that new hardware is especially designed for rendering digital VR environments (video games, simulators, etc). Editing captured 360º camera footage requires far less computing power – the hardware in our existing iMacs is already fully up to the task. In fact, the more we thought about it, the more we realized that there was very little holding us back from creating our own VR video content. We didn't really need new editing hardware, and we didn't necessarily have to wait for Apple to bring its VR tools to Final Cut either – we just needed a third-party VR conversion program to act as a middleman. Plus, like we talked about in Part 2 of this blog series, posting spherical video for mass consumption is now easier than ever. YouTube and Facebook both offer 360º video uploads, and they both employ intuitive controls to let the user 'look around' within the scene. Incredibly, this brought our list of excuses down to just one – we didn't have a 360º camera yet. A product category that's finally started to offer some compelling entry-level options. Perfect timing. So we bought a 360Fly HD and did a little experimenting. Anyway, we rigged it up, hit Record, and sent our Inspire 2 up to the heavens to see what we could see. The video was a little fuzzy, but still solid for a budget camera. Now that we had our epic 360º footage, it was time to prepare the footage for editing. This is typically how a 360º camera initially captures video. This is often called a 'video sphere' or 'fisheye video'. Until it's converted, it's not yet VR content. Because in this form, all 360 degrees are compacted and reduced to a single square video. That's why when the horizon is visible in all directions, it creates this trippy-looking warped globe effect. Before the recent VR update, Final Cut couldn't really make sense of this kind of raw VR video. A third-party application was needed to convert the fisheye video into a form that Final Cut could process. Luckily, our 360Fly camera came with conversion software for exactly that purpose. Granted, before Apple released the new VR tools, our editing options in Final Cut were limited. But with such fancy footage, we figured there was no need for fancy editing just yet. At least not for a proof-of-concept video. Now this is how footage should look after it's been converted for VR. In this form, it's known as 'equirectangular' video. Once the 360Fly software converted our footage to look like this, we were able to drop it into Final Cut and make some basic edits. We then had to send it to a third app to add metadata to the video file telling computers and video platforms to treat it like a 360º video. This may sound like a lot, but even with the the extra steps involved, we didn't find 360º footage that much harder to work with than regular footage. The fact that it only took us a few total hours to crank out a pretty great VR video is a testament to all the hard work and innovation happening at every level of the ecosystem, from durable budget cameras to user-friendly conversion tools to the intuitive 360º video experience on YouTube and Facebook. It's a great time to be a VR nerd. Having said that, the new VR editing tools in Final Cut Pro X have re-ignited our pioneering spirit for the platform. We can now import footage, create 360º projects with specialized effects and tools, and attach the proper metadata, all within Final Cut – no more bouncing around from app to app. Among the most useful tools we've found is something called 360º Patch, which makes it remarkably easy to digitally remove a camera or gimbal from the bottom of your 360º shot, making for a more seamless overall image. Another one, the Orientation tool, allows the editor to click and drag text and other elements anywhere in the 360 view, and the elements will conform to the same 3D space as the spherical video. You can even view your footage on a head-mounted display (HMD) while you edit, adding the full effect and functionality of VR headsets like the Oculus Rift. Apple throwing its support behind the platform may turn out to be one of the most important developments in VR. Not just for the new conveniences it adds to the content creation process, but also for what Apple could do for VR content distribution. Having developed some of the most novel and forward-thinking content distribution platforms of the last couple decades, it may not be long before virtual realty content gets the App Store treatment. Something to look forward to. But we're pretty hyped about VR right here and now, and we just bought a new 4K 360º camera. Better believe we'll be using it. Industry Buzz. Client Highlights. A gum-ball machine that only accepts Bitcoin.